Our busiest weekend of the year has passed! 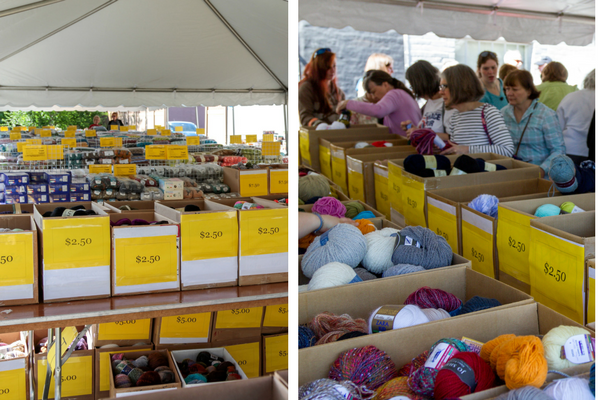 Keep scrolling for an insider’s look at our 15th Annual Tent Sale and Fleece Market! Saturday morning starts off with a quick meeting (and pep talk!) for store staff. 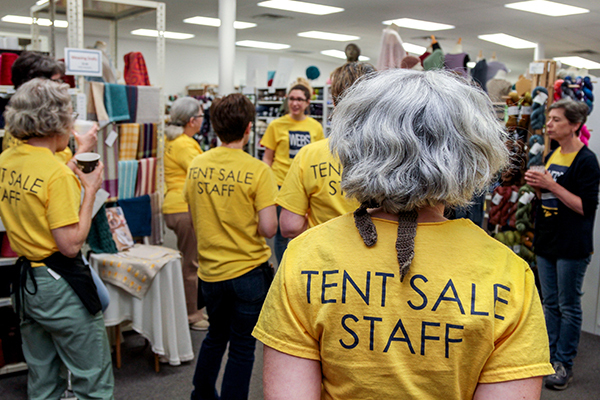 Tent Sale is all-hands on deck, so even those who do not work in the retail store are on hand to help out! We want to make sure everyone is on the same page – it helps the lines move faster, and helps us provide the best service we can to our customers. We have tons of high-quality yarns on sale! 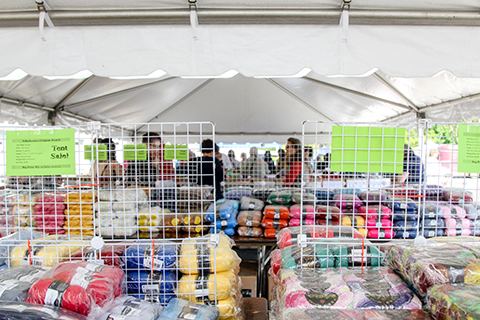 At Tent Sale, you can often find your favorite brands for $2.50 and $5.00 a skein – not to mention full bags of yarn at unbeatable sale prices! 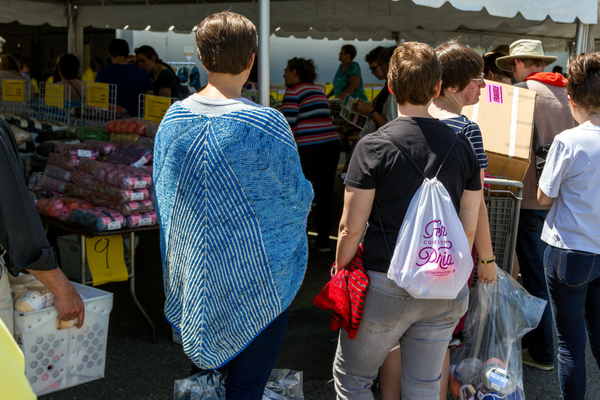 One of our favorite parts of Tent Sale is the annual Fleece Market on Saturday. Local farmers and artisans gather in our parking lot to sell fleeces, tools for fiber artists, luxury yarns, handmade goods, and sometimes, animals! 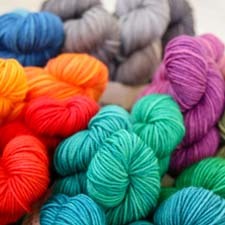 Madelinetosh on sale? Yes, please! Our store and warehouse are open all day! After shopping under the tent, customers come inside to take full advantage of the WEBS discount! Did you know that WEBS is dog-friendly? 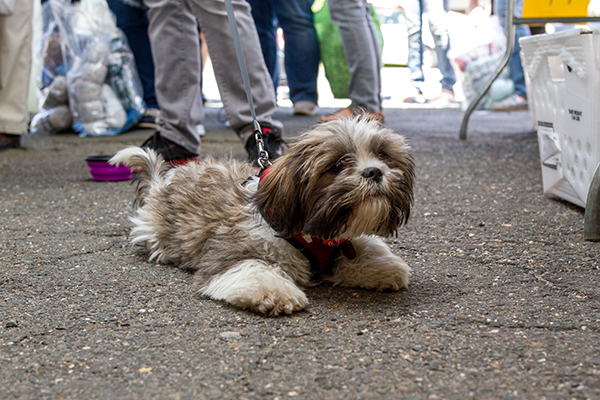 Even our four legged visitors are excited to shop! 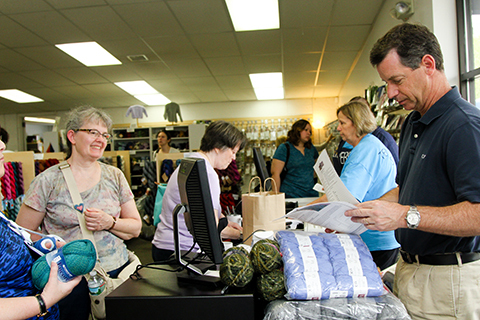 Did you miss our 15th Annual Tent Sale last weekend? Don’t fret! Our 43rd Anniversary Sale is in its last days, and we have a full list of amazing deals you can shop online! 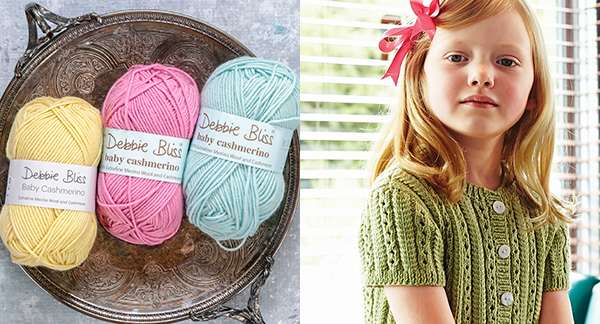 Click here for a list of May Anniversary Sale yarns! Our 43rd Anniversary Sale is beginning to wind down, but there’s still time for big savings. Stock up on some of our favorites before the sale is over! 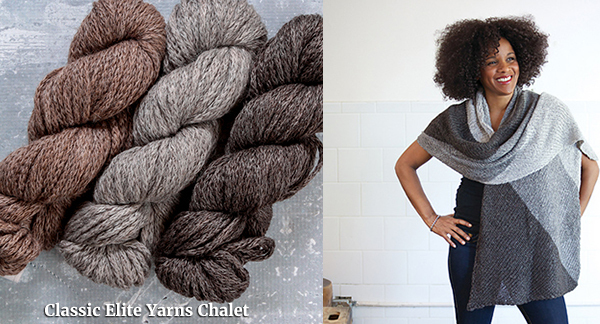 Classic Elite Yarns Chalet is an undyed bamboo and alpaca blend with a chainette construction in a bulky weight. 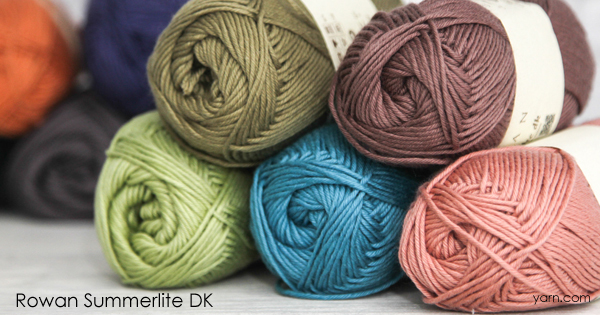 Anything you knit in Chalet will be warm and cuddly, with an unbeatable softness and drape. Try knitting the Color Block Bias Wrap from Classic Elite. The neutral colors and graphic stripes will give your outfits a bold, modern look. 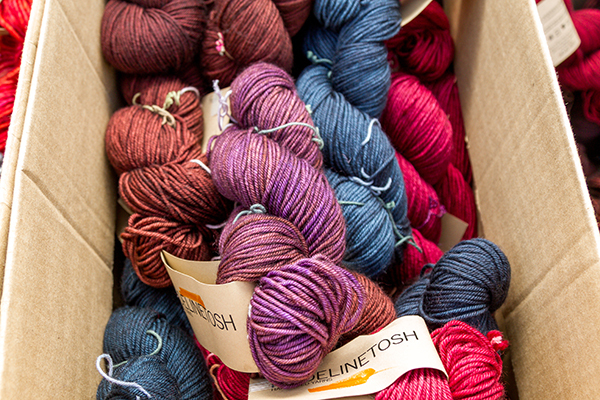 A WEBS favorite is Elsebeth Lavold’s Silky Wool. We can’t get enough of the nubby texture and stunning colors to select from! 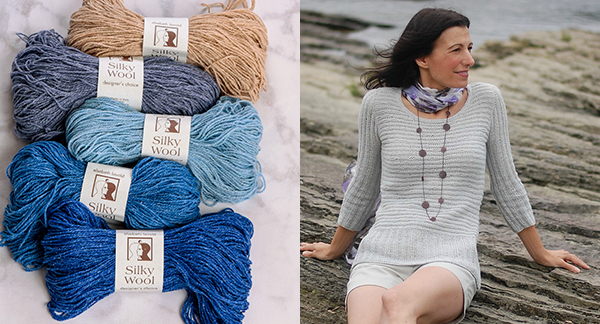 We love the Silk and Saltwater pullover from Lyrical Knits, with a flattering shape and simple ribbed texture that would look fantastic in any color – bold or neutral. This sweater is the perfect backdrop for Silky Wool. 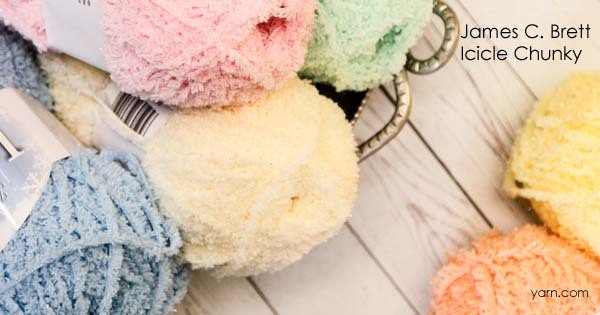 Complete with a fresh, contemporary color palette, Debbie Bliss Baby Cashmerino is an ultra-soft machine-washable blend of Merino Wool, microfiber, and cashmere – there will be no need to worry about knitting something for the new baby! The Cable & Lace Cardigan from Debbie Bliss is an adorable short-sleeved cardigan with a delicate horseshoe eyelet lace motif that’ll be easy to dress up or down. 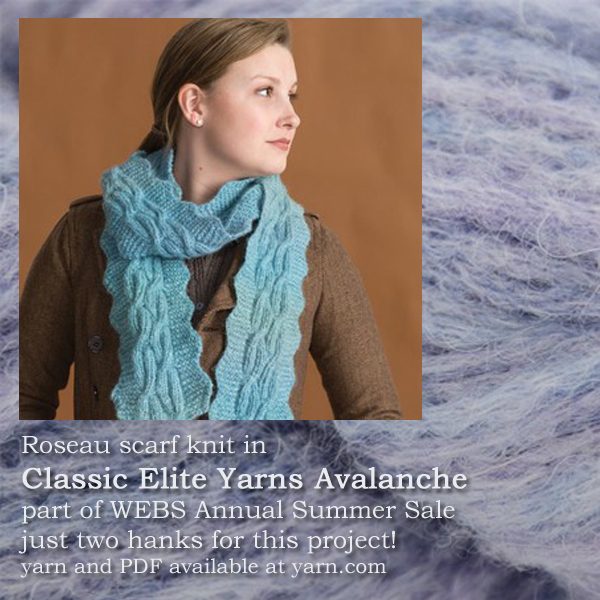 For tremendous yardage at an affordable price, Eco + from Cascade Yarns is the way to go. With a generous 478 yards per hank and a sale price of $16.49, Eco + is a no-brainer – many projects will only need a few skeins! 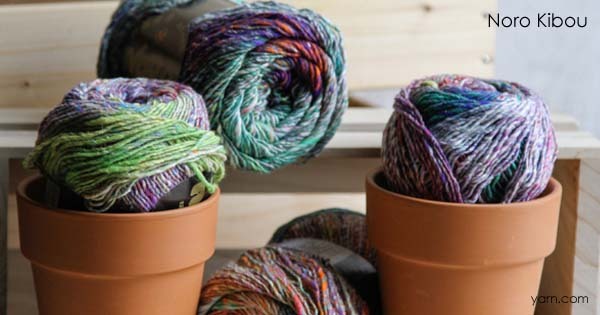 Pick a neutral and a few bright colors to make Tin Can Knits’ Pop Blanket*. *Original Pop Blanket is knitted using Eco + as the main color, and Noro Kureyon as the accent. 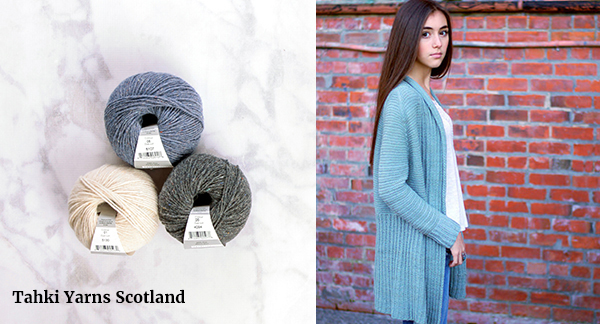 Scotland from Tahki Yarns is a 100% Merino wool tweed with a soft, slightly felted appearance. Scotland is a DK weight, and would be a fantastic choice for the easy-to-wear Big Sister cardigan from When I Grow Up. This seamless, open-front sweater combined with the soft color palette of Tahki Scotland, will be a welcome addition to your wardrobe. What will your next great project be? The WEBS 43rd Anniversary Sale ends on May 31st, so stock up while you can! And don’t forget- we offer our WEBS Discount to everyone, every day, in-store and online! This week, we’re LIVE from our 15th annual Tent Sale! Tune in to WHMP at 9am or watch us on Facebook Live! Kathy and Steve will be showing off some of our unbeatable deals, and talking all about our Fleece Market. 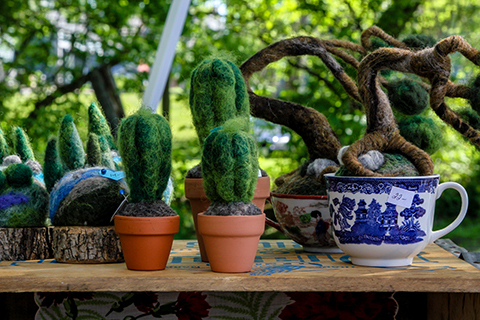 This year’s Fleece Market, which only happens on the Saturday of Tent Sale, will feature 15 local independent farmers and small businesses. 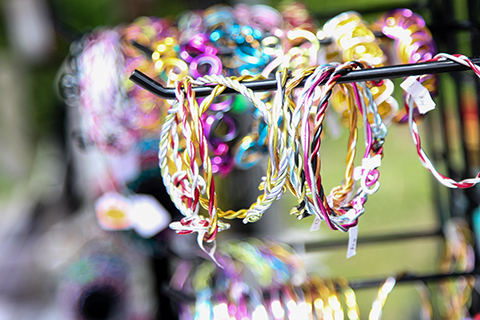 Click here for the full listing of vendors, and stop by from 10-5 to check out their booths! 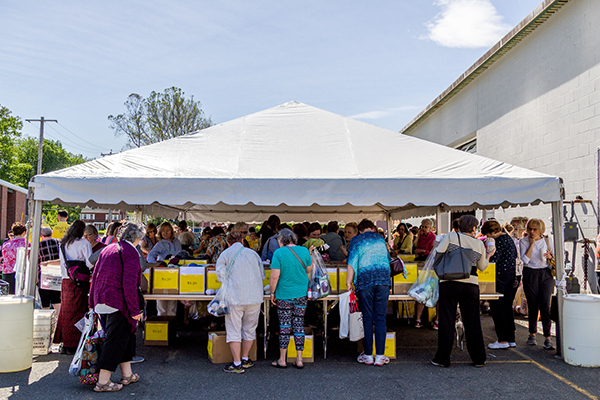 The WEBS 15th Annual Tent Sale will be going on from 10 – 5:30 on Saturday, May 20th, and from 10 – 4 on Sunday, May 21st – one of our rare Sunday openings! We hope you’ll join us . . . the deals are unbelievable! Please note, because this week’s show is LIVE, the episode recording will be available to download a little later. Stay tuned! Knit One Crochet Too Pea Pods – Tent Sale! 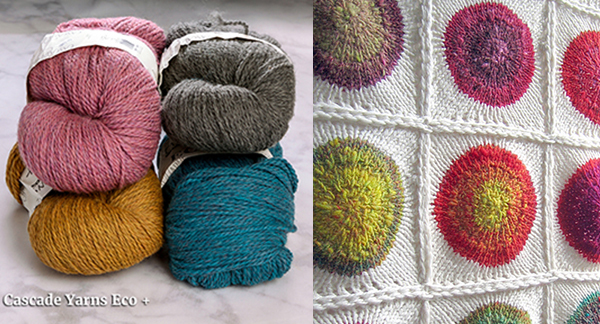 Noro Kibou – Tent Sale! Berroco Peruvia Quck – Tent Sale! Knitter’s Pride Dreamz Interchangeable Circular Chunky Set – May Sale! Mirasol Ushya – May Sale! 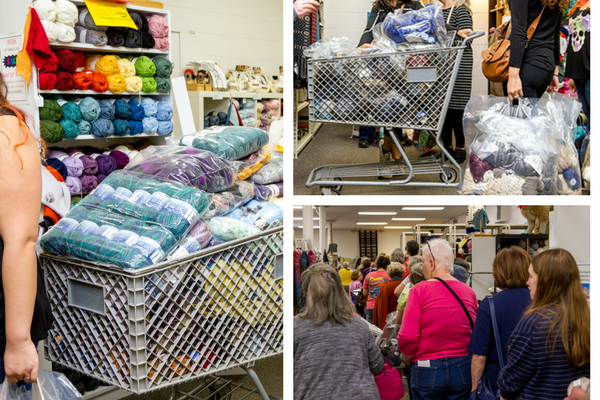 Tahki Yarns Tucson – May Sale! Dream in Color Classy– May Sale! Louet Gems Sport – May Sale! Shop our 43rd Anniversary Sale, going on now through May 31st! If you see something you like, grab it now – there will be new deals on May 1st! The I-91 Shop Hop will be taking place from June 22 – 25th! 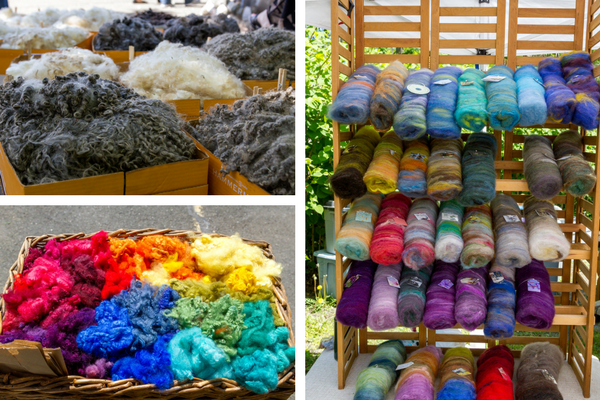 11 yarn shops along the 91 corridor from Putney, Vermont to New Haven, Connecticut are participating this year! Buy your 2017 Shop Hop Passport here, or pick one up from your participating local yarn store. Each time you get your passport stamped, you’ll be entered in a drawing at that yarn store. There will be amazing door prizes you could win – 44 in total. By visiting all 11 stores, you are entered in the grand prize drawing, which includes gift cards to all of the stores, and a basket full of other goodies. We’re so excited – stop by WEBS to say hi! Registration for the WEBS Retreat has filled! If you missed out, please consider signing up for the waitlist. We had many people come off the waitlist last year! WEBS is having a Rhinebeck Sweater KAL! There’s still time to sign up and start your sweater, so sign up now to join for a reduced rate! Click here for more information and to register! Be sure to follow us on Facebook and Instagram for lots of great new products, contests and fun! Check out all of our upcoming Events here. 5 Tips for Tent Sale! The wait is over – clean out the trunk of your car! This weekend, Saturday, May 20th and Sunday May, 21st WEBS will be hosting our 15th Annual Tent Sale at our Northampton, Mass store! Whether this is your first trip, or you’re a Tent Sale pro, here are a few insider tips for shopping our biggest in-store sale of the year! If you aren’t sure what you’re looking for, it’s not a bad idea to take a peek at our website and check out our offerings. Our May Sale is in full swing, and you can score some excellent deals under the tent, as well as in the store, and the warehouse. Coming with a few patterns, and having a list is an excellent idea, and will help give you some inspiration. Knowing what PDF patterns you’ll need printed out at checkout will help you as well. Of course, there will be yarns or sales that are just too good to pass up – so, be open to trying something new! WEBS offers a volume discount of 20% off of full priced yarns if you spend $60, and 25% off of full priced yarns if you spend $120. For more information about our discount system, click here! 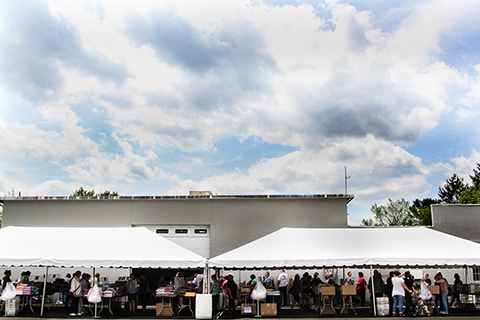 Historically, the Saturday of Tent Sale is our busiest day of the entire year! Every person who works for WEBS will be on hand to help, but not everyone will have the same knowledge as our retail store staff, especially in the hustle and bustle of a busy day. If you have specific questions about patterns, we suggest stopping by the store on another day, or taking advantage of our free drop in classes, if you can! We want to provide you with the best service we possibly can! 2. We can (almost) always order more! Because our store is in one location, and our shipping warehouse is in the next town over, what it says we have in stock online, doesn’t always reflect what we actually have on hand, which can be frustrating for customers who are traveling a long way to come to Tent Sale. There’s no need to fear though – we can order you the quantity you need at checkout, and if it’s in stock, we’ll ship it home to you for free! If the item is out of stock, we’ll backorder it for you, and charge your shipping fees when it hits the mail. If you’re shopping online this week, you can also select “in store pick-up” at checkout, and your items will be waiting at the store for you . . . but you’ll have to act fast – we need about 48 hours to fulfill these orders! 3. Don’t forget about our Fleece Market on Saturday! 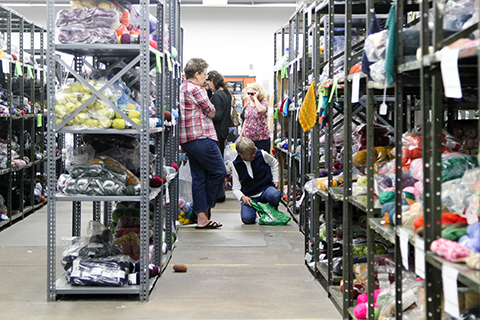 Everyone’s always excited for the Fleece Market, which takes place from 10 until 5 on Saturday. We’ll have 15 (!!!) local farms who will be set up around the perimeter of our parking lot, selling all kinds of goods, from fleeces and handmade yarn, to lamb meat and jewelry. Bring some extra cash – you never know what you’ll find! Check out a full list of vendors over here, with links to their websites. 4. There will be lines! There’s no avoiding it, there will be some waiting. Thankfully, we will have parking attendants on hand who will help you find a place to park easily. To alleviate wait times, we’ll have extra cash registers set up to accommodate everyone as quickly and smoothly as possible. We can’t avoid long lines though, so try to bear with us. So, wear comfortable shoes and bring a friend to chat with (or your knitting!) – you’ll get through that line in no time! 5. Bring a snack, or stop by the bistro bus! It’s a given – most people plan to spend a good chunk of time at Tent Sale. We encourage you to bring plenty of water and a snack. 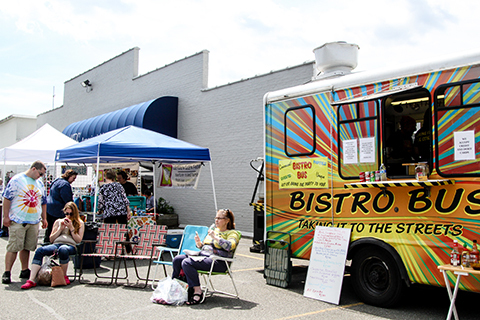 The Bistro Bus will also be parked in our lot for most of the day (10 – 3), so there’s no need to leave for lunch. Check out their menu! They have delicious offerings, like Asian Fusion Tacos, and Quesadillas, as well as weekly specials! Are you as excited as we are? WEBS will be open on Saturday from 10 – 5:30, and from 10 -4 on Sunday. 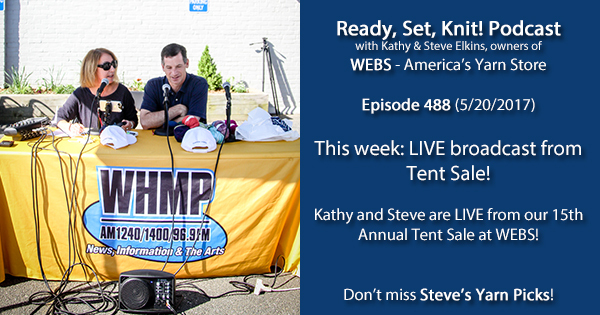 Don’t forget to tune into WHMP for Ready, Set, Knit!, which will be airing LIVE at 9. We’ll also be posting a virtual tour of the Fleece Market for those who can’t make it, but still want to get in on the action. Last Chance at Incredible Savings! Our annual Year End Blowout Sale is almost over and tomorrow is your last chance to save on over 100 yarns, needles and more! Incredibly, the sale has been extended for two extra days and of course the yarn has taken this opportunity to tell me more things I should be making with it! I’m still trying to focus on making some additions to my summer wardrobe so I’m looking at Noro Kibou and the Midori Pullover. That’s some fairly mindless knitting right there with gorgeous results! Just two rectangles, knit on the bias, that take advantage of the magical striping thing that Noro yarns do, and the Kibou is a mostly cotton and silk blend that makes it a wonderful summer yarn. I’ve got a mini vacation coming up in February with a couple long train rides and this may just become my travel project for that trip! And now that I’m thinking about garments I’m also thinking about how happy a good cardigan makes me and the Super Fine Merino Aran from Rowan would wonderful to work with, especially in that chestnut color. Maybe I could pair it with a stripe in the Teak or Smoke colorway for the Sawtelle Cardigan, lots of squishy, easy garter stitch! I love a versatile cardigan and I can see myself tossing this on with a pair of dress pants and an oxford or jeans and a t-shirt. But now I’m thinking that I also want a quick and easy, instant gratification project for myself, especially considering all the projects I just finished up for everyone else over the holidays, and how many I’ve planned already for this year. So, I’m going to pick up a couple skeins of Icicle Chunky and knit up a bright, white, wintery and quick cowl to wear on that trip I’m taking next month! This isn’t a yarn that would normally call my name but it is unbelievably soft and will certainly keep out the chill winter wind. Good thing the Colonial dpns are on sale, I don’t have anything in my stash big enough to knit this one! What projects have you planned for your Sale purchases? The Year End Blowout Sale is in full swing! With over 100 items in this years sale it’s hard not to find the perfect yarns to add to your stash or to cast on with right now! I’m already dreaming of summer projects, hoping I can get a few finished in time to wear them this year! Rowan Summerlite DK is a beautifully soft, 100% cotton, DK weight yarn that has me dreaming about a cute cropped cardi for me and maybe one for my niece. 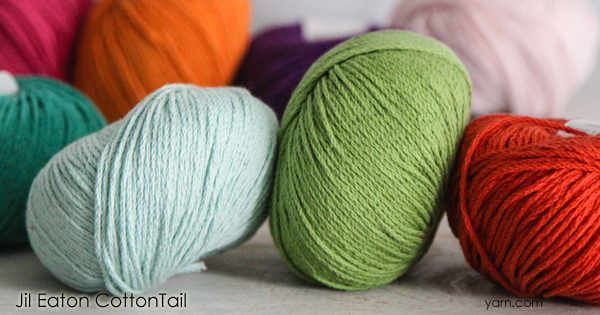 Jil Eaton CottonTail is another 100% cotton yarn, this time in a cable plied, worsted weight, and it might just be perfect for a lacey, summer poncho in a bright pop of color. Cascade Yarns Sateen Worsted keeps calling my name and telling me that it wants me to make a blanket. I walk past this yarn almost every day and I keep seeing new color combinations and they start spinning in my head like a kaleidoscope, and then I’m wondering should I knit or crochet? Since I’m planning to use this yarn over the winter I think I might knit a blanket since I don’t need to worry about being bundled up under it as it grows, that’s kind of the point isn’t it? Now, do I go with simple stripes, log cabin, or something even more colorful? And if I didn’t already own a set of Addi Click needles I’d be getting one because they’re at a great price! That’s my plan for now. 3 yarns, 4 projects, though I still need to make a decision or two on what those will be, and I’ll have 2 tops, a gift and a new blanket for summer. That is if I don’t walk by another yarn that starts calling my name! What are your plans for your Year End Blowout Sale purchases, or are you stashing for a rainy day? And don’t forget that if you’re within driving distance you should stop by our retail store for deals that you won’t find online! You’ll find directions here. Our Year End Blowout Sale Starts Tomorrow! It’s that wonderful time of year when Steve needs to clear the shelves to make room for the incoming inventory of new yarns for 2017, and that means incredible prices on closeouts, discontinued colors, overstock yarns and more. 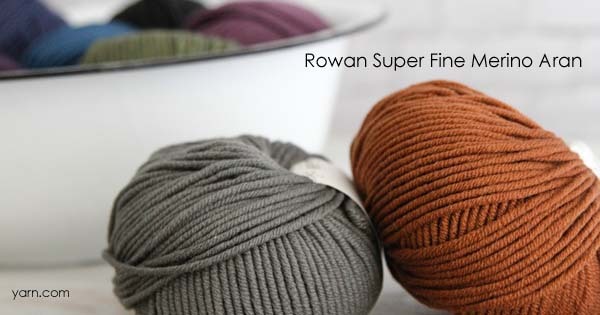 Stock up on favorites from Cascade, Berroco and Plymouth, as well as over a dozen yarns from Rowan and a great selection from Noro, K1C2 and other favorite brands. Don’t believe me? Here’s Steve to tell you more! With over 100 items in the sale you’ll find just what you need for a winter’s worth of fantastic knitting, crochet and weaving projects! The Sale starts online tomorrow, December 20 and in our retail store December 26, and ends Monday, January 2, 2017. Check the Preview flyer for all the details! WEBS closes at 4pm on Saturday Dec. 24th and Saturday Dec. 31st. WEBS is closed Sunday Dec. 25th and Sunday Jan. 1st. Some of these yarns are closeouts and no further inventory is available, please make note of second and third color choices in the special instructions during checkout, so you don’t miss out on yarn you really want! Bulky Bliss in our Annual Summer Sale! August means Summer Sale time here at WEBS and this year we have some fantastic deals on great bulky yarns, and more, for your upcoming Holiday projects. Modern technology makes Techno a feather-weight, bulky yarn! Baby alpaca is blown into a mesh tube of silk for really fast knitting with literally no splitting. 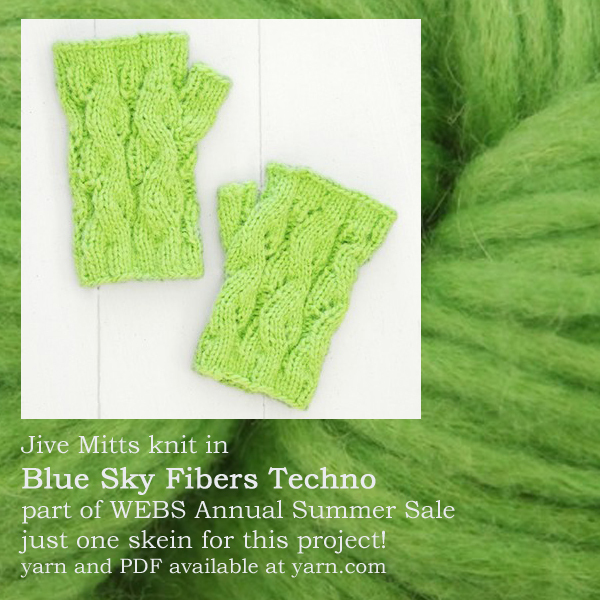 You’ll knit up a pair of the Jive Mitts in no time! Worked in the round in an easy mock-cable pattern with just one hank of Techno, these little fingerless mitts will be great for cool mornings. Schachenmayr Boston Mix is an acrylic & wool blend yarn in a super-fast-knitting bulky weight. Bold, bright colors mix with more subtle tones to create a fun, self-striping yarn that’s machine washable. One skein will make one hat! 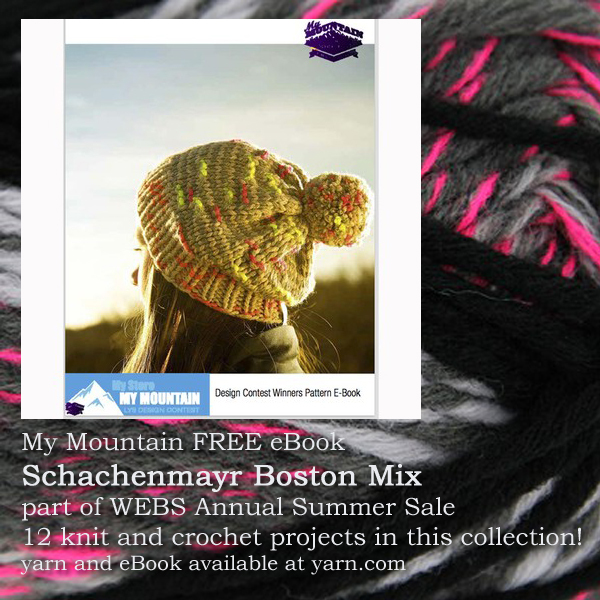 The My Mountain Design Contest Winners eBook comes with 12 fun and funky knit and crochet patterns. Adriafil Scozia is a soft (very soft!) blend of wool, viscose & polyamide – in a bulky weight that knits up fast! With a time-honored tweedy look, and a range of classic colors this is the perfect yarn for cozy pullovers & cardigans, hats, accessories and blankets. 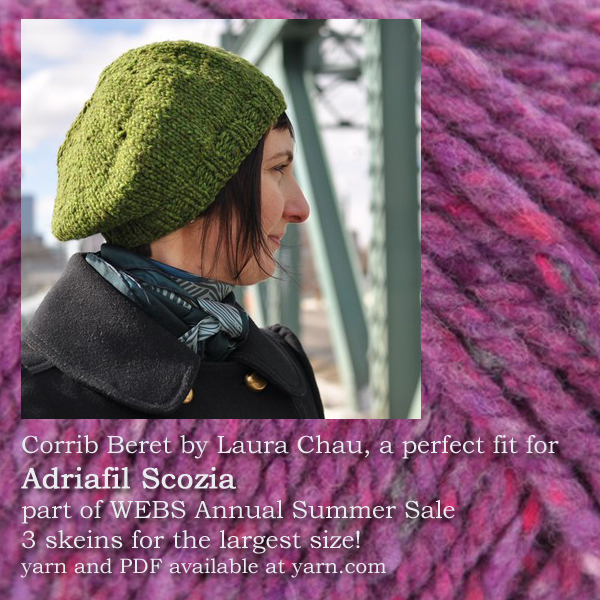 The Corrib Beret by Laura Chau is a quick and easy slouchy hat, an accessory you need in lots of colours! This chunky beret is just slouchy enough without too much bulk. 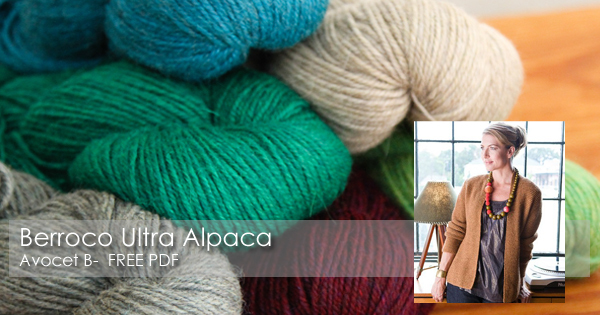 Classic Elite Avalanche is a very light and lofty yarn in a blend of alpaca, wool & nylon. The long gradual color shifts mean that your projects will be done in no time when you just want to get to the next color shift before stopping. Roseau, a beautiful scarf that features reversible, ribbed cables and zig-zag edges. With over 60 featured yarns in the sale this year there’s something for every project you can dream of! Anniversary Sale Spotlight – Last Chance! Our Anniversary Sale is coming to a close tomorrow! We’ve had two full months of incredible deals on yarns for knitters, crocheters and weavers, as well as needle and hook sets. With just over 24 hours before these sale prices end you have one last chance to shop these deals and build your stash for summer and even holiday knitting! Take home your choice of over 100 yarns and needle/hook sets now, at savings of up to 30%, while you still can! Wednesday morning at 12:00am they’ll all be full price again. Anniversary Sale Spotlight – Favorites! 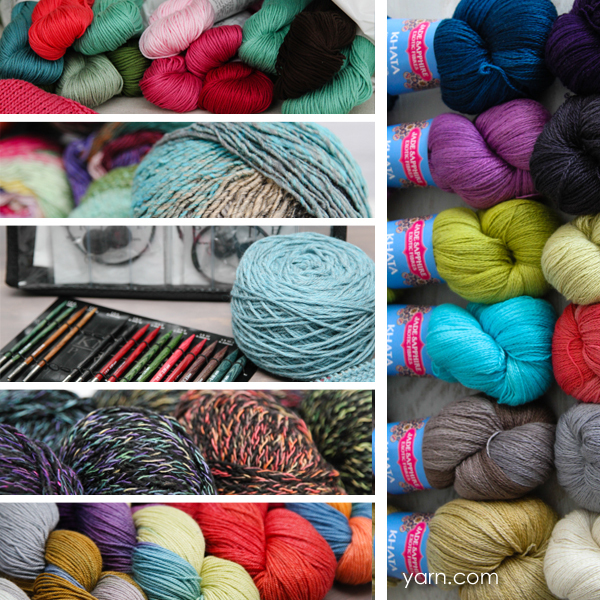 This week I thought I’d share some of my favorite yarns from the Anniversary Sale this year. I knit and crochet but these yarns are versatile enough to be perfect for both and they all make great stash yarns for future, unknown projects! I love a good one skein project and Frosted Leaves from Louisa harding is just that! A simple, repeating leaf motif with a garter stitch border that shows off the stunning self-striping colors of Amitola Grande, this pattern is one I keep in the last minute gifts folder. Not only is it a free pattern but the yarn is a heavy worsted weight and one skein completes the project. During the sale that means this whole project only costs you $17.49! 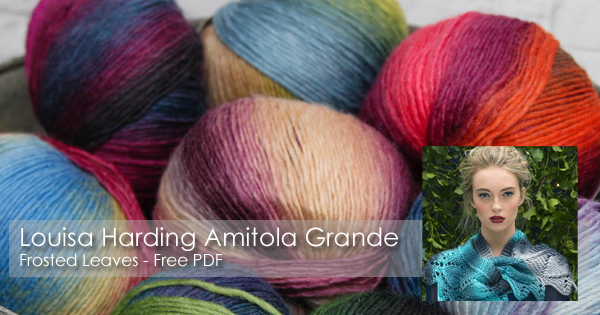 Amitola Grande is a single ply yarn with a blend of 80% wool and 20% silk, you get warm fluffyness from the wool and strength and shine from the silk, and there are some gorgeous colorways here. 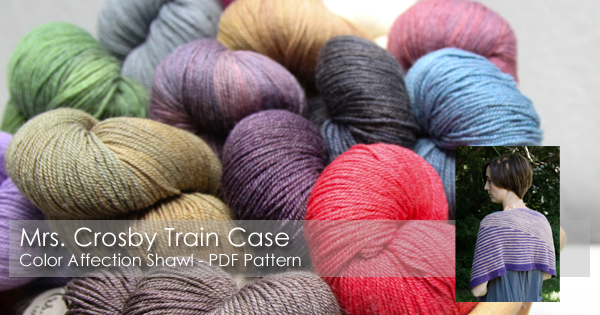 I’ve made several projects with yarns from Mrs. Crosby and Train Case is one of the best. A blend of superwash merino, nylon and Outlast – that futuristic rayon fiber technology that continuously interacts with your body to moderate your temperature and keep you from being too hot or too cold. The future is here! not only that but it’s machine washable. The hand dyed colors of this yarn are just stunning and sometimes you really need to just let them take center stage. And sometimes you need a project that has lots of visual interest when finished but doesn’t take a lot of brain power in the making, I can’t keep track of a complicated project and pay attention at my daughter’s softball game! The Color Affection Shawl is just the right fit, lots of easy-peasy garter stitch and simple stripes to keep you going without too much effort, and the result is a stunning shawl! The Jo Sharp yarns are just some of the classiest yarns I have in my stash. 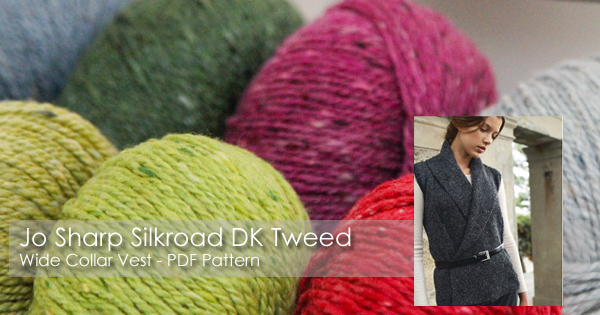 Silk Road DK Tweed is an incredible blend of 85% wool, 10% silk, and 5%cashmere in earthy, organic tones with pops of tweedy color. The two-ply structure and fiber blend knit up into a fabric with a beautiful hand and great drape but it still has a good amount of body. I love this yarn for garments. I am also a big fan of versatile patterns and the Wide Collar Vest and Cardigan pattern is just that. Take your pick of a cropped cardigan or a longer vest, both with generous lapels. The vest seems like the kind of layering piece that I would wear a lot! Loose and casual with a tshirt and jeans around the house, or more tailored and belted with dress pants and a button down shirt for the office. Finally, Berroco Ultra Alpaca is one of the first yarns that I stashed and I keep finding ways to use it, it’s just that good. With over 40 incredible colors, in soft heathered solids from striking jewel tones to classic neutrals, there’s color for almost every project you can imaging. The Avocet B sweater, a free PDF, is one that’s been in my queue for a long time and this might just be the right time to cast on. An incredible comfy cardigan in all-over garter stitch, I might just live in this one! 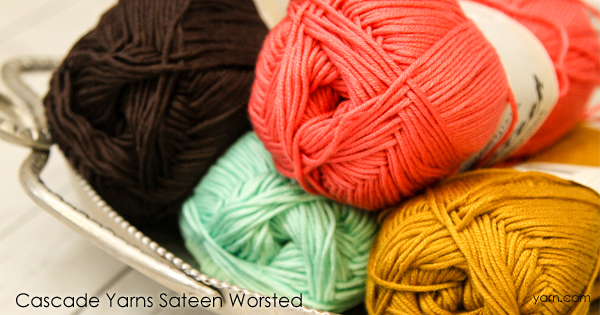 So there you have 4 of my favorite yarns from the May portion of our Anniversary Sale. What are some of your favorites and what plans are you hatching for them?